whose perfect shape led some to it as Little Fuji while others call it Musubi Mountain. When 210 days past from Risshun (the beginning of spring), it is a season of the rice flowering and also Typhoon season. 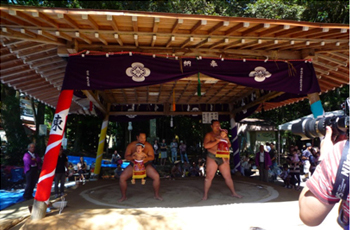 Kazadomesai is a children's sumo tournament to keep off a typhoon. "kaza" means wind, and "dome" means to stop, therefore, this festival is to send away the God of wind by offering sumo tournament. ♣ Children's sumo tournament starts 1pm. It is held 17 times since this festival started and kindergartener sumo will start from this year. It is to promote children's healthy body, and to give an opportunity to learn and feel Japanese mind and culture through this festival. Before the tournament starts, there is "a baby's dohyou-iri" (the ceremony of entering the ring for babies) to pray for their good health. We always welcome professional sumo rikishi to hold babies and this year's guest rikishi were coming from the Shikoroyama stable to help the festival. Copyright © 2012 Iimori Shrine All Rights Reserved.